There’s a lot to like about replacing a missing tooth with a dental implant. This state-of-the-art restoration is by far the most durable and life-like option available. And unlike other replacement options implants stimulate bone growth, a major concern after tooth loss. For that reason we encourage getting an implant as soon as possible — for adults, that is. We don’t recommend implants for younger patients because even a teenager’s jaws haven’t yet reached full maturity. Because it attaches to the jaw differently, an implant can’t move with the growing jaw as real teeth do. It would eventually look as if it were sinking into the jaw below the gum line or being left behind as the rest of the jaw grows. It’s best, then, to postpone placing an implant until the jaw fully matures, usually in a patient’s early twenties. In the meantime, there are some things we can do to prepare for a future implant while also restoring the tooth with a temporary replacement. As previously mentioned, our biggest concern is bone health. Like other living tissue, bone has a growth cycle of older cells dissolving and newer ones forming in their place. The teeth transmit the pressure produced when we chew to the bone to stimulate this growth. With the absence of a tooth, the adjacent bone no longer receives this stimulation — the growth cycle slows and may eventually lead to bone loss. 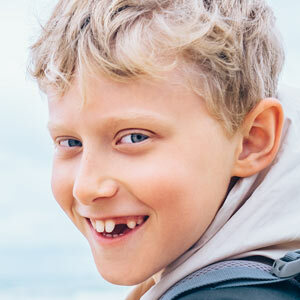 We can help this situation by placing a bone graft in the missing tooth socket at the time of extraction. The graft serves as a scaffold that’s eventually taken over and replaced by new bone growth. We can also try to control how fast the graft is replaced by using grafting material that’s slowly removed and lasts longer — often a preferable situation if an implant is years away. As for appearance, we can create a custom partial denture or even a type of bridge that bonds a prosthetic tooth to neighboring teeth without significantly altering them. If the patient undergoes orthodontic treatment it’s also possible to add prosthetic teeth to an orthodontic appliance. Eventually, we’ll be able to provide the permanent solution of a dental implant. With careful planning and measures to preserve bone health, there’s a good chance the outcome will be worth the wait.